Tasty is a modern testing framework for Haskell. It lets you combine your unit tests, golden tests, QuickCheck/SmallCheck properties, and any other types of tests into a single test suite. Tasty is a modern testing framework for Haskell. It lets you combine your unit tests, golden tests, QuickCheck/SmallCheck properties, and any other types of tests into a single test suite. To find out what's new, read the change log. scProps = testGroup "(checked by SmallCheck)"
unitTests = testGroup "Unit tests"
tasty is the core package. It contains basic definitions and APIs and a console runner. In order to create a test suite, you also need to install one or more «providers» (see below). tasty-wai - for testing wai endpoints. It's easy to create custom providers using the API from Test.Tasty.Providers. Ingredients represent different actions that you can perform on your test suite. One obvious ingredient that you want to include is one that runs tests and reports the progress and results. Another standard ingredient is one that simply prints the names of all tests. It is possible to write custom ingredients using the API from Test.Tasty.Runners. tasty-rerun adds support for minimal test reruns by recording previous test runs and using this information to filter the test tree. For example, you can use this ingredient to only run failed tests, or only run tests that threw an exception. tasty-stats adds the possibility to collect statistics of the test suite in a CSV file. tasty-discover automatically discovers your tests. tasty-expected-failure provides test markers for when you expect failures or wish to ignore tests. Every option can be passed via environment. To obtain the environment variable name from the option name, replace hyphens - with underscores _, capitalize all letters, and prepend TASTY_. For example, the environment equivalent of --smallcheck-depth is TASTY_SMALLCHECK_DEPTH. Note on boolean options: by convention, boolean ("on/off") options are specified using a switch on the command line, for example --quickcheck-show-replay instead of --quickcheck-show-replay=true. However, when passed via the environment, the option value needs to be True or False (case-insensitive), e.g. TASTY_QUICKCHECK_SHOW_REPLAY=true. If you're using a non-console runner, please refer to its documentation to find out how to configure options during the run time. You can also specify options in the test suite itself, using localOption. It can be applied not only to the whole test tree, but also to individual tests or subgroups, so that different tests can be run with different options. It is possible to combine run-time and compile-time options, too, by using adjustOption. For example, make the overall testing depth configurable during the run time, but increase or decrease it slightly for individual tests. It is possible to restrict the set of executed tests using the -p/--pattern option. Tasty patterns are very powerful, but if you just want to quickly run tests containing foo somewhere in their name or in the name of an enclosing test group, you can just pass -p foo. If you need more power, or if that didn't work as expected, read on. A pattern is an awk expression. When the expression is evaluated, the field $1 is set to the outermost test group name, $2 is set to the next test group name, and so on up to $NF, which is set to the test's own name. The field $0 is set to all other fields concatenated using . as a separator. As an extension to the awk expression language, if a pattern pat contains only letters, digits, and characters from the set ._ - (period, underscore, space, hyphen), it is treated like /pat/ (and therefore matched against $0). This is so that we can use -p foo as a shortcut for -p /foo/. The only deviation from awk that you will likely notice is that Tasty does not implement regular expression matching. Instead, $1 ~ /foo/ means that the string foo occurs somewhere in $1, case-sensitively. We want to avoid a heavy dependency of regex-tdfa or similar libraries; however, if there is demand, regular expression support could be added under a cabal flag. Return the at most n-character substring of s that begins at position m, numbering from 1. If n is omitted, or if n specifies more characters than are left in the string, the length of the substring will be limited by the length of the string s.
Convert the string s to lower case. Convert the string s to upper case. Return the position, in characters, numbering from 1, in string s where the pattern pat occurs, or zero if it does not occur at all. pat must be a literal, not an expression, e.g. /foo/. Return the length, in characters, of its argument taken as a string, or of the whole record, $0, if there is no argument. Launch the program with +RTS -N -RTS. To apply timeout to individual tests, use the --timeout (or -t) command-line option, or set the option in your test suite using the mkTimeout function. Timeouts can be fractional, and can be optionally followed by a suffix ms (milliseconds), s (seconds), m (minutes), or h (hours). When there's no suffix, seconds are assumed. sets a 30 seconds timeout for each individual test. It is possible to add custom options, too. To query the option value, use askOption. See the Custom options in Tasty article for some examples. There may be several ways to organize your project. What follows is not Tasty's requirements but my recommendations. Place your test suite sources in a dedicated subdirectory (called tests here) instead of putting them among the main library sources. test.hs is where your main function is defined. The tests may be contained in test.hs or spread across multiple modules (Mod1.hs, Mod2.hs, ...) which are then imported by test.hs. Re-organize the project into a library and a program, so that both the program and the test suite depend on this new library. The library can be declared in the same cabal file. Add your program sources directory to the Hs-source-dirs. Note that this will lead to double compilation (once for the program and once for the test suite). Tasty executes tests in parallel to make them finish faster. If this parallelism is not desirable, you can declare dependencies between tests, so that one test will not start until certain other tests finish. after AllFinish "pattern" my_tests will execute the test tree my_tests only after all tests that match the pattern finish. 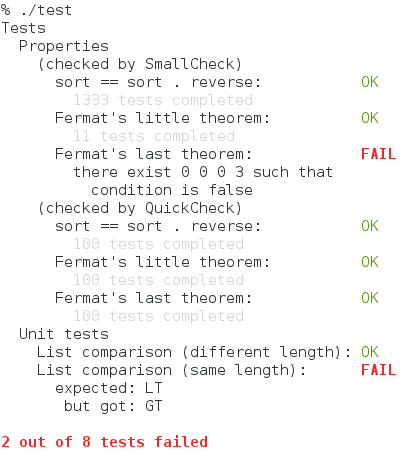 after AllSucceed "pattern" my_tests will execute the test tree my_tests only after all tests that match the pattern finish and only if they all succeed. If at least one dependency fails, then my_tests will be skipped. The pattern follows the same AWK-like syntax and semantics as described in Patterns. There is also a variant named after_ that accepts the AST of the pattern instead of a textual representation. testGroup "Tests accessing the same resource"
testGroup "Tests creating and using a resource"
If Test B depends on Test A, remember that either of the may be filtered out using the --pattern option. Collecting the dependency info happens after filtering. Therefore, if Test A is filtered out, Test B will run unconditionally, and if Test B is filtered out, it simply won't run. Tasty does not currently check whether the pattern in a dependency matches anything at all, so make sure your patterns are correct and do not contain typos. Fortunately, misspecified dependencies usually lead to test failures and so can be detected that way. Dependencies shouldn't form a cycle, otherwise Tasty with fail with the message "Test dependencies form a loop." A common cause of this is a test matching its own dependency pattern. Using dependencies may introduce quadratic complexity. Specifically, resolving dependencies is O(number_of_tests × number_of_dependencies), since each pattern has to be matched against each test name. As a guideline, if you have up to 1000 tests, the overhead will be negligible, but if you have thousands of tests or more, then you probably shouldn't have more than a few dependencies. Additionally, it is recommended that the dependencies follow the natural order of tests, i.e. that the later tests in the test tree depend on the earlier ones and not vice versa. If the execution order mandated by the dependencies is sufficiently different from the natural order of tests in the test tree, searching for the next test to execute may also have an overhead quadratic in the number of tests. When my tests write to stdout/stderr, the output is garbled. Why is that and what do I do? It is not recommended that you print anything to the console when using the console test reporter (which is the default one). See #103 for the discussion. Use testCaseSteps (for tasty-hunit only). Use a test reporter that does not print to the console (like tasty-ant-xml). Write your output to files instead. Blog posts and other publications related to tasty. If you wrote or just found something not mentioned here, send a pull request! Oliver Charles is the backup maintainer. Please get in touch with him if the primary maintainer cannot be reached.